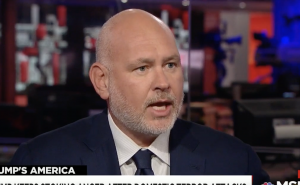 MSNBC political analyst Steve Schmidt likened President Donald Trump's invocation of a migrant caravan heading toward the southern border to the 1933 Reichstag Fire in Germany on Monday, in spite of his own past admonitions against casual Nazi comparisons. Schmidt is a former Republican strategist who now supports Democrats and is one of the Trump administration's most vocal critics. He is prone to giving lengthy speeches on MSNBC about his disgust with Trump and the modern Republican Party for what he views as complicity with the president's demagogic leadership style. "This whole caravan in the last week of the election is a giant lie," he said. "This is Trump's Reichstag Fire. It is a lie, in that the United States military, the most powerful armed force in the world, would be deployed at a brigade-sized unit level, to the southern border to stop this caravan, which is 1,000 miles away and made up of women and children. The insinuations that it is made up of terrorists and Middle Easterners … 40 percent of the country has opted into an alternate reality." The Reichstag Fire is historically invoked as a famous "false flag." Adolf Hitler, newly installed as Chancellor, and the Nazi party blamed a Communist conspiracy for the fire and used it to seize emergency, authoritarian powers. Many historians believe the Nazis were behind the fire to provide cover for their tactics. Schmidt has previously tweeted "Nazi analogies should be used with circumspection and precision." Shortly after Trump was inaugurated in 2017, he wrote to stop making such analogies, because "it diminishes the magnitude of the crime." Nazi analogies should be used with circumspection and precision. Schmidt also ripped White House adviser Kellyanne Conway for declaring the suspected shooter's anti-Semitic motives in the Pittsburgh synagogue massacre to be "anti-religious" before he declared certain conservative media figures and outlets had "blood on their hands." "The propaganda industry that she commands, with the vile president that she serves, abetted by Mark Levin, and Rush Limbaugh, and Breitbart, and NewsBusters and Judicial Watch and all the rest of them, have blood on their hands for the incitements that they have made that have triggered and radicalized these crazy people," he said. "It is deliberate in intent. He scapegoats minority populations. He alleges conspiracies. He creates a sense of shared and virtuous victimhood, positions himself as the avenger, and there is no cost too high, so long as it benefits his narcissism, so long as it benefits him politically."